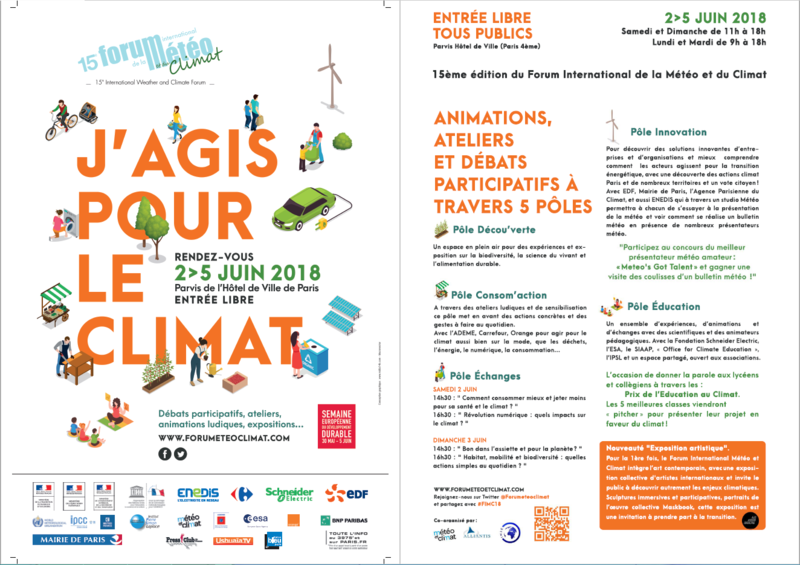 Educational activities, workshops, exhibitions and participatory debates on the theme « Acting on climate change in everyday life », attended by people committed to climate awareness such as scientists and weather reporters gathered in Paris, on Place de l’Hôtel-de-Ville. Everyone will be able to understand the challenges arising from global warming, and to discover the key tools necessary to change his actions on several aspects of his everyday life; water, waste, food… 4-5 June: special focus on raising awareness among school children and teachers. The 5 best “middle” and “high school” pre-selected projects will be presented by students on place de l’Hotel de Ville (Paris City Hall) on June 5, 2018. Middle school pupils at the 11th Weather and Climate Forum, from Forum Météo.